This is quite possibly one of my all time favourite picture books. Originally published in 2002, it was a Caldecott Honor Book in 2003, with a tenth anniversary hardback edition published in 2012. This edition was produced with a poster of DiTerlizzi’s stunning artwork on the underside of the dust jacket and is just so beautiful from start to finish. The language, evocative of the time in which it was written, offers a wonderful opportunity to introduce young readers to words that may have fallen from more common use today – cunning, curious, flattering – while hearing of how the spider attempts to lure the pretty little fly, in all her Victorian finery, into his parlour. The exquisite gothic style illustrations are almost delicate, laced with intricate details that allude to the true nature of the Spider all the way through, from the somewhat innocent bug print wallpaper to the more alarming butterfly wing curtains, firefly lamps and ladybug footstool. While this may appear to be quite morbid for a children’s book, as the deceased are bugs they serve as more of a point of curiosity for smaller kids rather than being too scary, while allowing for a rich reading experience, engaging visual literacy skills and offering older readers (youth and adults alike) more to explore with each additional reading. 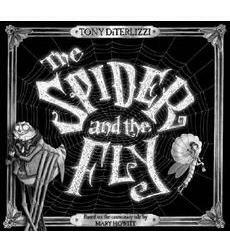 While it stands on its own two feet as an entertaining, beautifully written and illustrated book, I would also highly recommend The Spider and the Fly as a way to broach and discuss the topic of body safety and ‘tricky grown ups’ with children from ages 3 through to 16.